Many homeowners are increasingly conscious of the benefits of improving the thermal rating of their homes. Recently at the GO-ASHI meeting, Todd from USA Insulation spoke to our group of ASHI inspectors about some of the ins and outs of an existing residential home’s attic insulation. Todd prides himself on doing extensive research about trends in home insulation and stays up on the latest scientific findings. 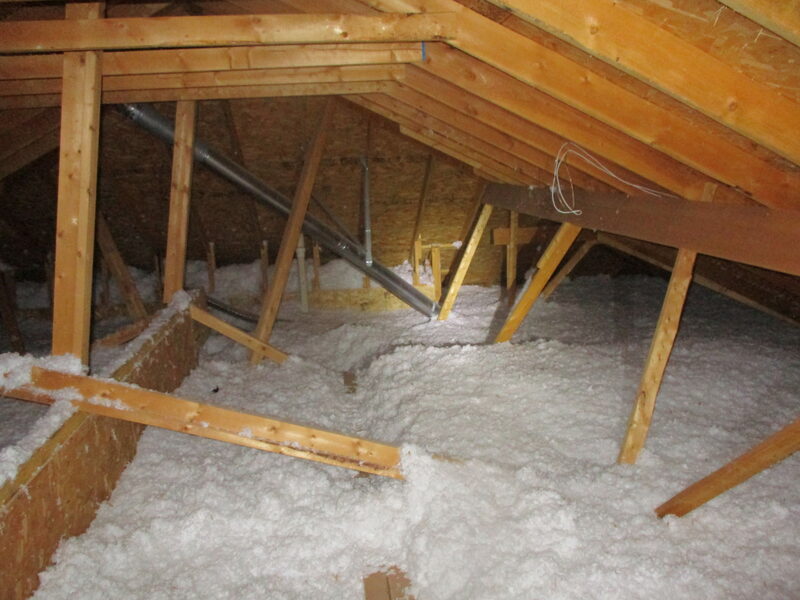 When trying to assign an R-Value to the insulation in an attic, there are many variables that must be taken into consideration. The depth of the insulation alone does not paint an accurate picture of how well attic insulation is actually performing. For insulation to be effective there needs to also be an air barrier. An air barrier slows the passage of air between conditioned and unconditioned spaces. For example, the air barrier between a living room and the attic space above is simply the drywall. Air gaps in the air barrier are a weak link in an insulation system, and can really undermine its effectiveness, regardless of how thick the insulation is. The laws of thermodynamics dictate that the air will follow that path of least resistance. Some of the common weak spots where air can pass through are whole house fans, can lights, and attic access panels. It is important to seal these areas, or the expected R-value from insulation depth will not be achieved. Foam board can be used to build airtight covers over these areas and then surrounded with blown-in insulation. Which is better – loose fill/ blown-in insulation or batted/ rolled insulation? Rolled Fiberglass insulation is often not the best option and can result in lower than expected R-value due to poor installation. Because of the way it is most often installed, air can pass through gaps between rolled out sections and rafters. Blown-in cellulose or fiberglass is typically a better option. It is relatively inexpensive and easy for a do-it-yourself homeowner to install. Cellulose insulation has a higher R-Value per inch than fiberglass. “Dense Pack” cellulose also a good option for existing homes with limited space/access to add more insulation. It has a higher R-Value per inch than regular cellulose.